Have you been sitting in traffic on the Braga Bridge in the last decade and looked north to see a new bridge being built? Ever wonder when the hell that thing was going to bedone. Today the bridge, named the Veterans Memorial Bridge, had a soft opening today. 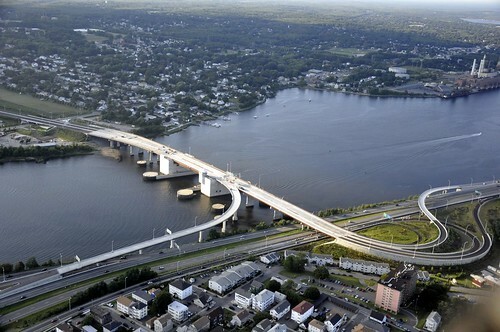 The bridge will eventually connect Route 79 in Fall River to Somerset. The bridge carries Route 6 and will replace the aging Brightman Street drawbridge, which was built in 1906. The new bridge is also a drawbrige, but with a higher span, will require less openings allowing road and water traffic to move more freely. 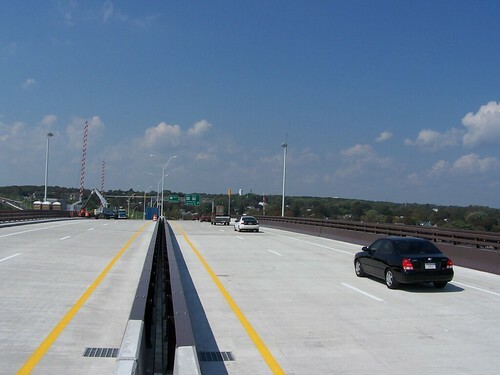 The $292 million bridge, which has taken more than a decade to build, was dedicated on Sunday, along with the bike path, named after Army Private Michael E. Bouthot of Fall River, who was killed in Iraq in 2006. Do you know if there’s any hope of running trains on this bridge? Most of the rest of the ROW from the rail tunnel to Fall River is intact, and Fall River has stronger commute ties to Providence than to Boston. I’m not sure what the plan is for the Brightman Street Bridge, but I’ve always thought it would work well as a transitway. Connect it to a bus or BRT on Route 195 at the Somerset end, and then run along the waterfront in Fall River. It could even continue on to Newport if we ever rebuilt the bridge to the island. Does Massachusetts, Providence and Worcester RR, or Amtrak/Conrail or CSX still own the rail right-of-way between Warren and Fall River? Or has it been sold off or simply abandoned and taken by adjacent owners? The 195 corridor might make more sense for a commuter corridor, whatever mode, as it’s more direct and central to the current suburban communities between Providence and Fall River. I think its going to come down as part of the original project plan. As of May, it barely had any street connections available when they disconnected it from the 79 ramps and brightman streets on the Fall River end. I’d guess that even if kept it would lack street connections on the Fall River side when the reconfigurations are completed, so there won’t be any reason for it to be there. I’d heard that there was a movement to keep it in place as a tactic to keep the proposed LNG plant from being possible further upriver. And lastly, why in the world did the Mass legislature choose to name yet another piece of infrastructure “Veteran’s Memorial”. Surely there are other groups and individuals who deserve to be memorialized. I think you might be right about it coming down, but I do recall that gambit to use it as a way to block LNG, so I wonder where it actually stands now. I don’t know exactly what its structural issues are right now, I’m pretty sure it has a pretty severe weight restriction on it currently. It could be the deck is shot and the piers are fine, if so, it could be pressed back into service for transit relatively affordably. For transit, it would not need to maintain or have connections to Route 79 (which has been proposed to be turned into an urban boulevard anyway, but that might never happen). Rail could connect to the existing rail along the waterfront. If it were light rail, there may be FRA weight issues, in which case light rail may need it’s own track. I think there is plenty of room for a roadway to be built for BRT if that were the transit option. Hess recently abandoned its plans for the LNG terminal, so using the old bridge to prevent the LNG terminal is no longer a reason to keep it. There would need to be groundswell of political will to retain or modify the old bridge for transit purposes. It probably has already been budgeted within the cost for the new bridge to demolish the old bridge. Realistically a conventional bus would be sufficient for serving commuting needs between Somerset, Swansea, and Fall River. A transit-way that would connect Fall River to Providence (or perhaps including New Bedford and Newport) would likely be the only way to justify a major transit improvement, even if were just BRT. If a BRT were planned, the 195 center median within suburban Massachusetts would be a logical location for BRT lanes. Urban areas in Fall River, East Providence, Providence, and New Bedford would pose challenges and added costs to create dedicated BRT lanes. The costs for BRT lanes in the 195 median would tens of millions if not more, which may not be too realistic goal in the immediate term given the current atmosphere in Washington and the state of the economy. Having said that this period would be a great time to plan for such a line and build the political support.